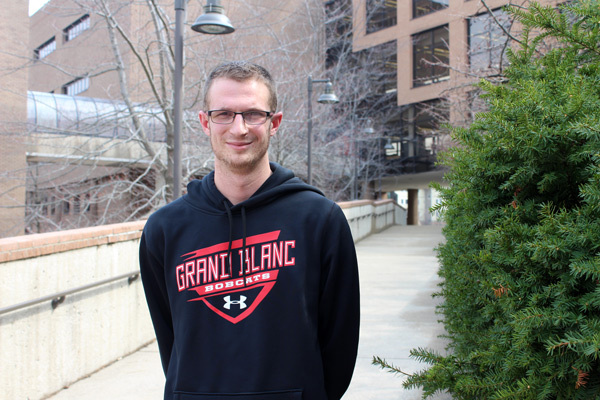 For University of Michigan-Flint elementary education senior Jordan Seath, student teaching at Brendel Elementary School in Grand Blanc has fostered his drive to be a role model for young children in the classroom and to nurture their innate desire to learn. A graduate of Swartz Creek High School who played basketball and golf, Jordan remembered the genuine support he received from his teachers while he was in school, and especially in first grade when his mom passed away. His teachers were there for him and never let him get behind. In April his student teaching experience in Katie Hoffmeyer’s third grade class will come to an end. Then he will transition to a long-term substitute position in the school’s resource room working with children who have special learning needs. UM-Flint elementary education courses have prepared him well to manage a classroom effectively and to carry out all of the challenging aspects of a professional teaching role. By combining his classroom mentor’s guidance with research-based teaching skills and knowledge gained from the program, Jordan has solidified his own passion for shaping each child’s future. He knows that whatever comes next for his career, he doesn’t expect to teach a classroom of children by himself. It takes a dedicated team of educators to support each child’s growth and to show them how making mistakes and pushing through a tough task is just part of the process. This entry was posted in Education, Programs on March 30, 2017 by SEHS.